Bryophytes resembling liver were previously termed as liverworts. The name liverwort was first applied to genus Conocephalum because of a fancied resemblances of its lobes to those of liver. Hepatophyta or Hepaticopsida is the current name applied to this group of plants. Where leaf are dorsiventral without a protonema stage. In leafy forms two lateral rows of leaves , Phyllis and sometimes a small ventral row of leaves amphigastria. Distinct oil bodies in the cells of the most. Rhizoid if present are unicellular and also scales on the lower surface. Sporophyte enclosed within the calyptras and perianth or pseudoperianth during development. Capsule lacking columella and is not able to make photosynthesis. No special mechanism is present for spore dispersal. 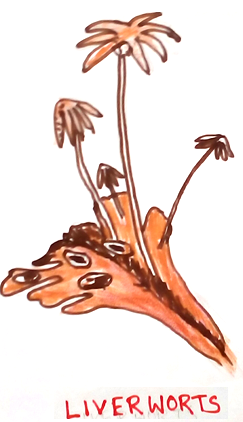 Sporophyte or sporangium is completely parasitic in nature. Some examples of liverworts are Riccia, Marchantia etc. Riccia – small prostrate dichotomously branched green fleshy thalloid that produces rosette- shaped green patches on shady wet banks, wet soil, moist rocks, damp walls and tree trunks generally during rainy season. The thallus lobe are 1-2 cm long , linear, wedge shaped or obcordate with an epical notch, thickened midrib and a dorsal groove. Lower surface bears unicellular colourless rhizoid, smooth walled and tuberculate. Vegetative reproduction can be occurs by means of fragmentation, adventitious branches, persistent apices,tubers, rhizoid proliferation. Sexual reproduction is oogamous. Plants may be monoecious or dioecious. Oospore undergoes segmentation and forms diploid sporophyte.Ventral wall proliferates to produce two layered calyptras around it. Marchantia – The thallus is larger than the Riccia thallus. Dorsal groove, midrib and apical notch with dichotomous branches are present but rossete shaped is rarely formed. The upper surface has polygonal areas or areolae with ventilating air pore in the middle of each. Photosynthetic region consist of a layer of air chambers having assimilatory or photosynthetic filaments. Mucilage cells, oil cells, sclereids occur in storage region. The ventral surface has rhizoid and amphigastria. Vegetative reproduction occurs by gemmae are found inside small gemmae cups developing middorsally on vegetative thalli. Sexually Marchantia is dioecious. Porella /Madotheca – It is a foliose member of hepaticae ( almost 80% of hepaticae are foliose). It grows on shaded moist soil, rocks ,bark of trees . Dorsal leaves are incubous and bilobed with a larger antical lobe and a smaller portical lobe. Plants are dioecious. 1. In which liverwort do you find elaters? In Marchantia elaters help in gradual dispersal of spores and in loosening up the spore mass. 2. Name two Liverwort in which seta are lacking in their sporophyte. 3. Name a liverwort produce Gemma cup. 4. Name a dioecious and sexually dimorphic liverwort. 5. Name a liverwort in which the amphithecium is persistent and indehiscent and the spores are set free only upon disintegration of the capsule wall. In Spherocarpos seta is present although but it fails to elongate for spore liberation. In certain liverworts elaters are oriented with one end ,in each case attached to the base of the capsule called elaterophore. E.g. Pellia.